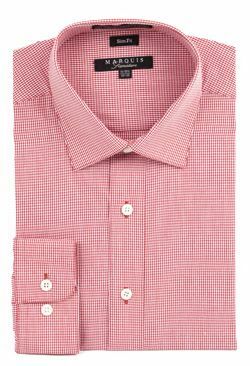 If you like the style of slim fit dress shirts that you might see a Celebrity like Anderson Cooper wearing on his show, this Red with white mini check slim fit shirt by Marquis will more than be a welcome addition to your fashion wardrobe. Featuring the newly popular slim fit cut, this dress shirt will look great on you. Fabric is wrinkle free Cotton/Poly blend for easy care. The red and white mini check design on this slim cut shirt will great with charcoal,navy and even black color slim fit suits for a well tailored slim fit look.